ForexScams.org is here to help. We are not only allowing you to report any Forex scam or suspicious behaviour. We are also here to educate you about the possibilites in this industries. What this means is that you probably have no idea how brokers can scam you without even knowing it. You do not even realize how they might take advantage of you and there’s nothing you can do – except for educating yourself and choosing brokers that don’t do anything like that. And here’s the solution: our Scamletter. This a regular newsletter you will receive with the latest scam alerts and updates. We will tell you the likelihood of getting scammed at any given broker and tell you where it is safe to stay. 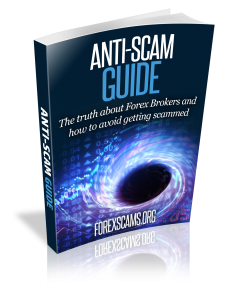 When you sign up to our scamletter you’ll also receive our Anti-Scam Guide – a book written by Forex veterans that know virtually any Forex scam out there. Yes, you won’t believe everything because it is really unbelievable at first. But the truth can be tough. Prepare yourself properly and sign up for our scamletter now. Otherwise you’ll trade in the dark and the next scam may be just around the corner.